Thaw your turkey completely –this may take 2-3 days. Remove all of the giblets from the turkey cavity and set them aside for later use (I use mine to make a stock which I use for gravy and/or stuffing/dressing). Mix your brine ingredient in a container large enough to hold them and your turkey. 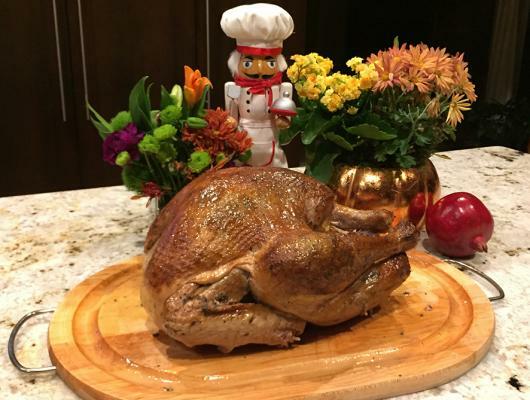 This could be a large pot, bag, or clean 5 gallon bucket – depends on the size of your turkey. You can also use a doubled trash bags and a cooler with ice. Place turkey in with brine and enough water to cover the bird. Brine your turkey in the refrigerator or a cooler for 12 hours or over night. Remove turkey from brine and dry completely with paper towels, inside and out. Allow to come up to room temperature. Meanwhile soak your wood chips in water for at least 30 minutes to several hours. Mix the butter, thyme, salt and black pepper together and rub under the skin (not every singe inch, but mainly the breast and thighs) same for the outside of the turkey. Preheat an electric smoker to 225°F. 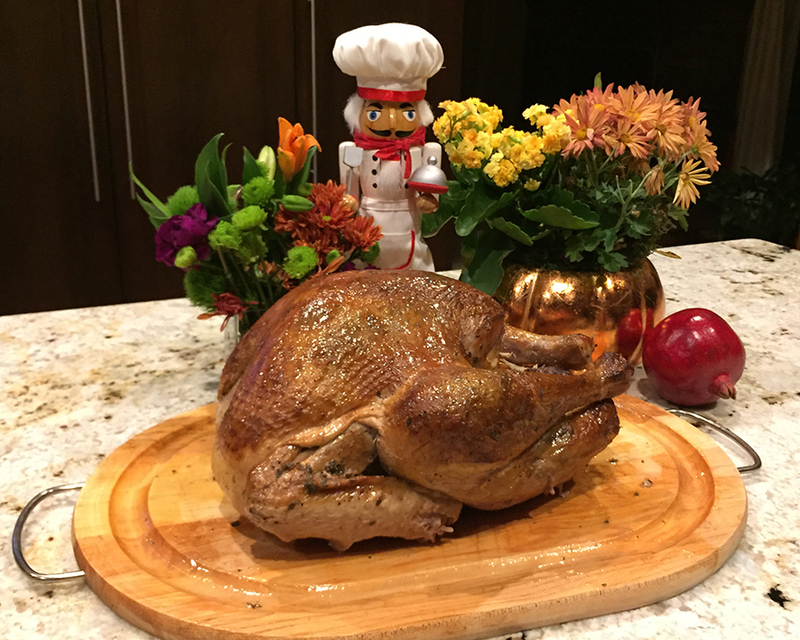 Place your turkey and one cup of water in a heavy gauge aluminum roasting pan and set on rack in middle of smoker. Place temperature probe in the thickest part of the thigh. Cook for an average of 15-30 minutes per pound or until temperature reaches 150°F to155°F in the thickest part of the thigh and juices run clear. Pull leg slightly away from the bird to check the color of the juices. Remove from smoker, tent with aluminum foil and let rest for 15-20 minutes. Temperature will continue to rise 5-10 degrees and this gives you time to make gravy if you haven’t already. Carve breasts off turkey one at a time, then slice them against the grain and place on a platter. Arrange all other meat on platter (see photo). Pour some of the juices over the meat and cover to keep warm until ready to serve. If you’ve never smoked a turkey or eaten one, you are in for a treat. The smoke adds a very subtle flavor and the brining keeps even the white meat juicy.